Enjoy Serephin's excellent coverage of the Coeur d'Alene Fourth of July festivities at 43rd State Blues. Read about Malia Obama's best birthday ever, hanging out with her family at the Holiday Inn Express in Butte. Meanwhile, George W. Bush had a birthday this weekend, too, and had a bit of a rough time of it during his holiday visit to Monticello. Isn't it ironic to contemplate the thought of Bush being in the same small club of U.S. presidents as Thomas Jefferson? Finally, a pause to remember Bill Studebaker, the Idaho writer and outdoorsman who died in a kayaking accident near Yellow Pine this weekend. I didn't know Bill well, but I remember when - still new to Idaho in the early 1990s - I invited him for a cup of coffee at the late great Twin Falls coffeehouse Metropolis to pick his brain about being a writer in Idaho. Red State Rebels' sympathy goes out to the Studebaker family and all of Bill's many close friends who were inspired by his boundless life force. In a couple days, we will be celebrating Independence Day. I'm going to be spending the holiday visiting with constituents of the 2nd District in Idaho Falls and Boise, and will be marching in both parades. I will also be speaking to Drinking Liberally tomorrow at MarCellars in Idaho Falls at 7:00 PM. I'd be pleased if you would join me. We must not let it escape us how amazing it is that, after 232 years, the great experiment of our Founding Fathers is still here; we, in fact, have a far more perfect union than that of our predecessors. This is because we have understood that one of the greatest things about our system is its ability to adapt when change is obviously needed. When this nation was founded, our nation was half-slave, half-free and women wouldn't receive the vote for 150 years. But the structure of our democracy allows us to grow upon our past achievements; we have never been so mired in tradition that we haven't been able to move forward when we saw that a wrong was being done under the auspices of the United States government. We are a nation of ethics, rather than a nation of traditions. That is why I am so proud of my country. But we must never think that we have reached our goal of a perfect union, that we can lean back and get too used to where we are. There are still reforms that are needed, and we must be constantly vigilant to avoid backsliding into the wrongs of the past. That is true patriotism, to protect the legacy of this country and to stop wrongs from being done in its name. I am running for office because I believe we deserve a government that seeks this improvement. Our health care system is broken with a large part of our nation's middle class unable to afford treatment. This is not acceptable, and it is a patriotic duty to attempt to improve the health care system so that every American can lead a healthy life. It is a patriotic duty to rehaul the energy economy at a time when it is scientifically clear that we are both running out of oil and seriously damaging our environment. And it is a patriotic duty to oppose the violation of fundamental constitutional rights, whether the victims of these violations be American citizens or foreign nationals. In a forward-thinking country such as the United States, patriotism equals a willingness to look ahead, to see what needs to be done, and to try to fix it. Today, two days before the Fourth of July, I see us on the verge of a new period of necessary reform. But there's nothing new about it. A willingness to see change and the capacity to hope are the basis of what has made America what it is; the greatest nation in the world. Visit my campaign's website and donate to the campaign at ActBlue. It's a historic night. Use this as an open thread to react to the Montana and South Dakota results as well as the likelihood that Barack Obama will, any hour now, cross the delegate threshold to claim the 2008 Democratic presidential nomination. And be sure to watch the video - a beautiful summation of how far we've come and a rousing call for the months of hard work ahead. What was the turning point of this campaign? Iowa seems like a logical choice, when he took first place and Hillary Clinton finished third. But I'd argue that the Potomac Primary on Lincoln's Birthday was the one that really showed Obama's strength, as he claimed 60%+ wins in both a major fall battleground state (Virginia) as well as in reliably Democratic Maryland. And let it always be remembered that our great state of IDAHO gave the senator his largest margin of any state, more lopsided than any of Clinton's biggest wins in Appalachia. 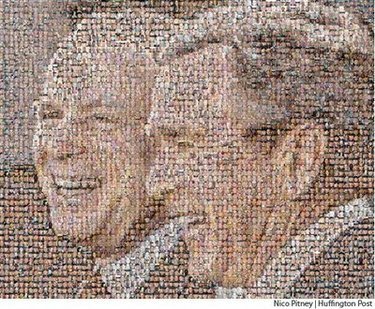 I don't know if you've yet seen this powerful image from Nico Pitney at the Huffington Post, but it's a mosaic created with the photos of the 4,000 U.S. troops, so far, who've died for the Bush admin's lies. How many more will die or be wounded for life if John McCain gets the chance to extend the war, as he has vowed to do? Frontline is airing a two-part documentary reviewing "Bush's War." Part I was broadcast last night, and Part II airs tonight. The entire show is also available online. By the way, Michael Kirk, the show's producer, is a graduate of the U of I. This was a helluva essay on NPR's Morning Edition today, recorded by Veterans Administration chaplain Thomas Phillips, who is notified via computer every time a member of our armed forces is killed. Should we shout? Should we scream? Should we shout? Should we scream? What happened to the post-war dream? Oh Maggie, Maggie what did we do? Yes, Pink Floyd lyrics. Roger Waters was writing about (and to) the architect of the Falklands War, Margaret Thatcher, best known for her eponymous economic program and the train wreck of an economy it has brought modern Britain, and known less-than-affectionately among her countrymen as, "Mrs. Thatcher the milk-snatcher" for her ultra-conservative antics in a junior cabinet post in the early 1970s. But, it appears the Republican front-runners are going out-of-their-way (by the width of the entire Atlantic Ocean!) to embrace the controversial neo-colonialist former occupant of 10 Downing Street; what exactly are Giuliani, Romney, and Thompson trying to tie themselves to? A war that killed nearly 1,000 people over a clump of rocky sub-arctic islands with a population of scarcely 3,000? The economic program that reversed decades of progress toward social justice in one of the world's great powers and plunged it into a nearly permanent state of recession? The ghost of Reagan past?